I have a cell phone cover that I love. Not because it is pretty, but because my iPhone does not get treated delicately and it has done an amazing job protecting it. Take the cover off and it still looks like new...minus a few crumbs from sharing space in my purse with goldfish crackers. But it is a little worse for the wear. All of the pretty red color is almost completely scratched off of the back. I have thought of replacing it, but they have changed the cover before and I am afraid that I won't be getting the exact same case. So instead I think I am going to use this handy idea from Happy Together and dress up the case that I love with a little fabric and some decoupage. Mine currently doesn't have a fabric cover, so I am going to have to wing the stencil, but I don't think it should be too hard. You can check out her tutorial HERE. 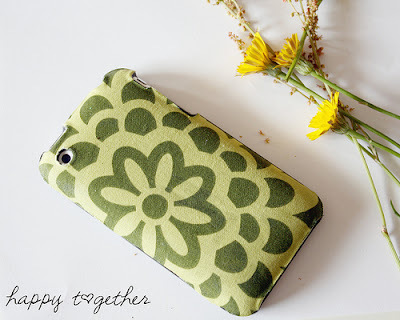 Well, I too was using the fabric cell phone cover previously and it helped me a lot in protecting my phone. Recently, I had also purchased a cover from Rokform which is helping me to protect my phone from external environment.